You have an event you want to have, chosen a date, now what about a venue? There are so many options these days, from conference centers, hotels, to outdoor venues. It really all depends on what type of event you will have, but below are some major factors to think about when picking a location. The number one factor is the size of the location and the number of people you expect to have at your event. If you have 15 attendees, then you will not want a huge banquet hall. If you are expecting 500 people, then you will definitely need a large facility. If you plan on having catering at an event, you should find out whether a venue has an on-site caterer or if all catering must be done through an outside vendor. 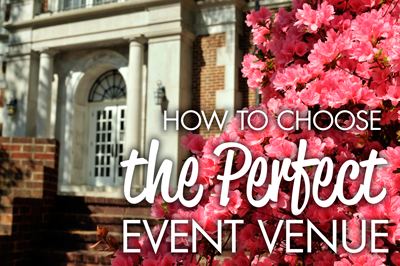 Before choosing a venue, consider which option is more convenient for you. Before looking at venues, set up a budget of what you can afford. There are different price ranges depending on the location. If you have a price point set up ahead of time, you will automatically narrow down your selection. When compiling a budget, consider fees such as rental, service, audio/visual, catering, decorations as well as the cost of additional vendors, entertainment or presenters. Location of a venue is a big factor. It needs to be easy for attendees to find and be sure that there is enough parking for your guests. If you are not providing catering for your event, then consider the proximity to restaurants. Are you looking for a professional environment? A casual environment? Or perhaps a party environment? Each event venue has its own atmosphere, so be sure to pick the right one for your event. Also, pick a location where the staff is friendly and readily available to assist you. If you need any audio/visual equipment, be sure that the venue has any of these available, and if that is an additional cost. If you will have attendees register, be sure that the location has a registration area large enough to accommodate your needs. Ultimately, choose a venue that fits all of your needs. Every event is different, as is every location. Good luck on your event planning experience!